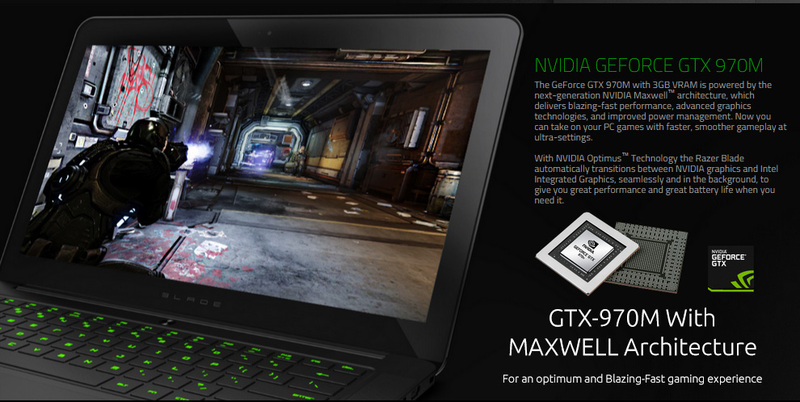 When talking about Razer Blade laptops, the only thing that comes to our mind is gaming, gaming and hard-gaming!!! 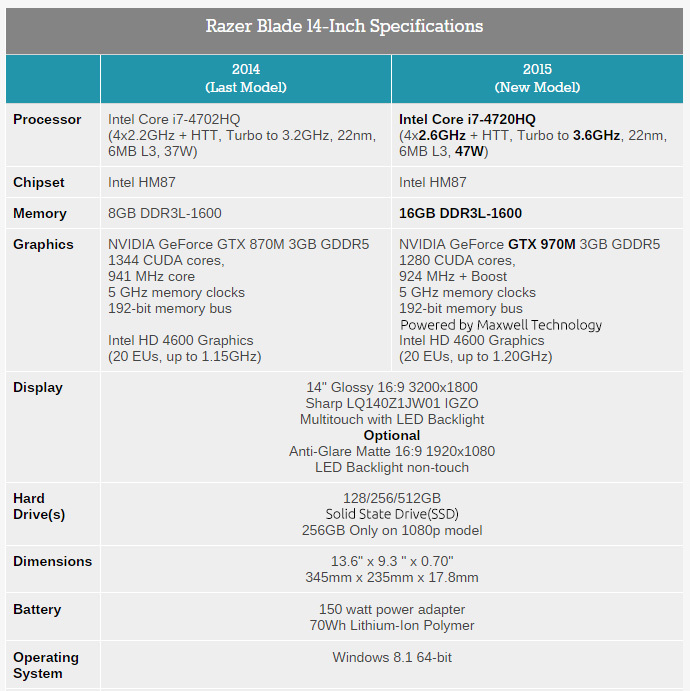 Recently, the company has launched Razer Blade (2015-edition) which is an upgrade to the 14″ NON-HD version of the Razer Blade (2014-edition). Let’s have a look at the changes. Razer Blade 2015 has got 16GB of RAM with a better CPU powered by i7 Quad-Core processor clocked at 2.6 GHz (3.6 GHz with turbo boost) with a better HD display and even more powerful GPU- Nvidia GeForce GTX 970M that were lacking in the previous version of Razer Blade. This serious upgrade will make any gamer fall in love with this portable gaming monster. The Razer Blade 2015 edition has got state-of-the-art display with IGZO technology (Indium Gallium Zinc Oxide). This technology provides unmatched color and image quality. The IGZO display has a significantly faster propagation time than traditional a-Si TFT displays which was used in Blade-2014 edition. This revamped display has improved video response for smooth motion video and immersive gameplay. Razer Blade’s 14-inch QHD+ display is of unmatched quality with 3200 x 1800 resolution with multi-touch, which pumps out 5.76 million pixels at 262 pixels per inch for breathtaking gaming experience. And the non-touch version is an IPS display running at 1920 x 1080 resolution with same great features as touch version except the resolution. The NVIDIA GeForce GTX 970M with 3GB VRAM is powered by the next-generation Maxwell architecture, which delivers jaw-dropping gaming performance, revamped graphics technologies, and more efficient power management. Now you can enjoy PC games with faster and smoother gameplay at the ultra settings. With NVIDIA Optimus, the Razer Blade automatically transits between dedicated(Nvidia) and Integrated (Intel-HD) Graphics, to give you great performance and enhanced battery life. Embedded 128/256/512 GB SSD to match you gaming need. Although the storage memory seems low but the high speed accessing of the memory loads the game faster and will give you a butter smooth gaming experience. Precisely engineered, Localized heating technology focuses on directing the heat away from the main touch surfaces of the laptop to the side areas that dissipate heat quickly and are not commonly touched by the users. .See the fact is getting rid of heat altogether is impossible but it can be kept away from the areas a user is less likely to touch.Summing up! 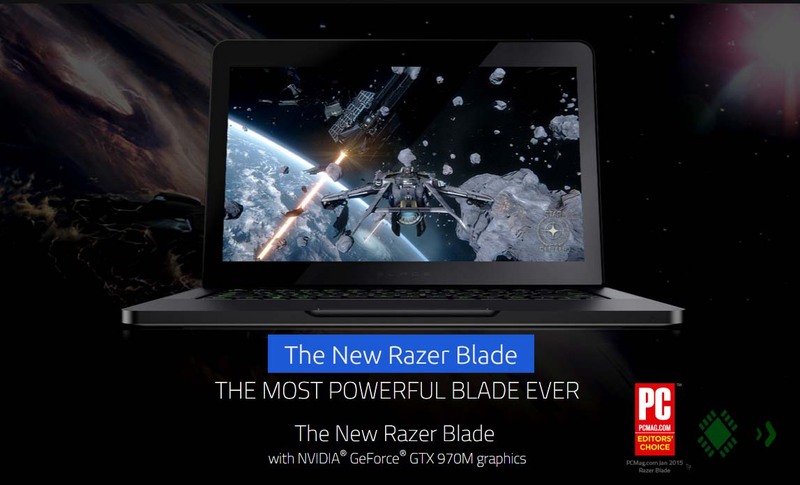 Razer Blade 2015 is most powerful Blade ever made, as it has got a powerful GPU & CPU supported by a HD-Display. No doubt, the experience would be breath-taking on this laptop as the new Nvidia GTX 970M is the best GPU, keeping the heat off while giving the optimum performance. These days it is hard to manage heat as the laptops are getting thinner and thinner while putting the power hunger GPU which generates enough heat. The heat management of Razer Blade 2015 edition is state-of-the-art.